Ford this year promoted 865 workers from Tier 2 to Tier 1 after it exceeded its Tier 2 cap. DETROIT (Bloomberg) -- When UAW members last month turned down the first labor contract negotiated between their union and Fiat Chrysler Automobiles, it looked like it might go badly for the union. It didn’t. After threatening to strike, union leaders got FCA to gradually increase hourly wages for more junior workers to more than $29 an hour, from a high of $19.28. The deal will cost the automaker close to $2 billion more over four years, including wages, improved 401(k) plans, bonuses and other benefits, two people familiar with the matter told Bloomberg. During the additional three weeks it took to get the enhanced accord, the UAW also saw General Motors -- its next target for contract talks -- post its most profitable quarter ever. While the FCA deal will be the starting point for negotiations with GM and Ford Motor Co., the UAW will probably seek an even more lucrative deal from them than smaller, weaker FCA. That may mean better profit sharing, bigger bonuses and more jobs. 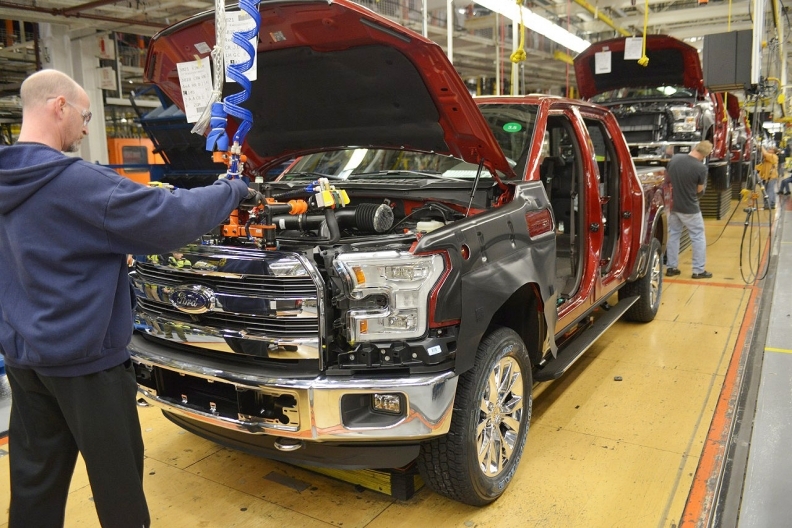 Those demands are almost certain to make Ford and GM’s contracts more expensive than the FCA deal, which was ratified by a 3-to-1 margin announced Thursday. Including inflation for health care, which the contract didn’t help avoid, the FCA agreement will cost the automaker close to an extra $2 billion, the knowledgeable people told Bloomberg. One potential offset: Ford and GM have fewer Tier 2 workers, and their pay jumped much more than that of veteran UAW members’ in the FCA contract. A deal costing more than $2 billion would be a reversal for Detroit, where bankruptcy and concessions from the union have driven labor costs down since 2007. Veteran workers haven’t had raises and new hires have been much cheaper. FCA’s UAW labor costs fell from $5.5 billion in 2007 to $3 billion last year and GM’s fell from $9.4 billion to $7.1 billion during that time, according to data from the Center for Automotive Research in Ann Arbor, Mich.
Shawn Morgan, a Fiat Chrysler spokeswoman, declined to comment about the costs of its UAW contract. Brian Rothenberg, a UAW spokesman, also would not comment. GM said in a statement that it would bargain “in good faith to obtain an agreement that meets the needs of GM employees and the business.” Ford seeks an accord that “enables us to continue providing jobs and investment here in the U.S. and that ensures a prosperous future” for the company and its workers, spokeswoman Kristina Adamski said in a statement. Union workers at GM and Ford will likely expect bigger checks for striking a deal. FCA’s second-tier workers will get $3,000 for approving their contract and veteran workers will receive $4,000. In 2011, GM paid workers $5,000 and Ford paid each union member $6,000, compared with $3,500 at FCA. The GM and Ford workers may want even more this time around, especially after GM said it will hit its goal of 10 percent profit margins in North America a year early, said Sean McAlinden, chief labor economist at the Center for Automotive Research. Wage increases will probably be the same, McAlinden said. That means entry-level employees would start at $17 an hour instead of $15.78 and get to the veterans’ new rate of more than $29 an hour over eight years, instead of being capped at $19.28. GM and Ford may have to provide more for the senior workers, which account for about 80 percent of union members at GM and and 72 percent at Ford. The UAW will need to make them happy to get any deal ratified. In the FCA contract, those workers got 3 percent raises in two of the four years and lump-sum payments equal to 4 percent of their pay, or about $2,500 each time, in the other years. GM and Ford will probably have to give bigger lump sums, though the hourly raise may be the same as FCA’s, McAlinden said. Then there is profit sharing. Fiat Chrysler has generally paid less, with about $9,000 over the four years of the last contract, as GM and Ford workers got more than $30,000. The UAW will want to keep that intact. At GM, workers will want to base the profit-sharing formula on operating profit, not net income, McAlinden said. They won’t want the costs of the ignition-switch recall and lawsuits crimping their bonus, he said. In the third quarter, GM reported $3.1 billion in adjusted earnings, a figure that excluded the $1.5 billion in costs during the period related to the switches. GM is already seeking goodwill, saying on Thursday it will add 1,200 jobs at a car factory in Detroit, but overnight announced a shift cut and about 500 layoffs at its small-car plant in Orion Township, Mich. The union will probably want even more job guarantees and a cap on temporary workers, said Cornell’s Wheaton. In its deal, FCA negotiated an agreement to potentially double temp workers’ hours, people familiar with the matter have said. To offset the cost, GM may seek more use of lower-paid temporary workers. The companies could also ask for changes to health-care benefits, Wheaton said. Ford may seek a break this time around. The automaker is the only company with a cap on how many entry-level workers it can hire. Once the rate of so-called Tier 2 workers reaches 28 percent, Ford must shift some of them to the traditional wage-and-benefits package. At a press event in July, UAW President Dennis Williams said he wasn’t “hung up on caps” so long as workers can get a middle-class wage. Since Ford has fewer Tier 2 workers than Fiat Chrysler, Ford may request to remove the cap in exchange for new hires and giving veteran workers better pay, McAlinden said. At Ford and GM, workers probably will be ready to fight for a better contract, especially after UAW members at Fiat Chrysler rejected the company’s first offer and got an improved deal. “They could see that turning down the agreement worked at FCA and do the same thing,” Wheaton said. Mark Clothier, Keith Naughton and Automotive News staff contributed to this report.